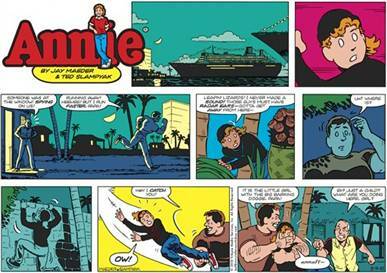 The Little Orphan Annie comic strip is ending, at least in print. They're going to keep a presence online, which...yeah, the online generation and the Little Orphan Annie generation are about three wars apart. Admittedly, this is one of the comic strips I skipped over every Sunday, along with "Prince Valiant." (Don't hit me, Lisa!) How about you? Were you fans of any of the soap-operay strips, or just Peanuts and Fox Trot?